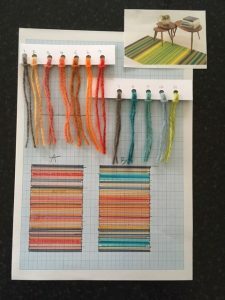 Home / Blog / 101 ways to commission an Angie Parker handwoven rug or textile artwork. 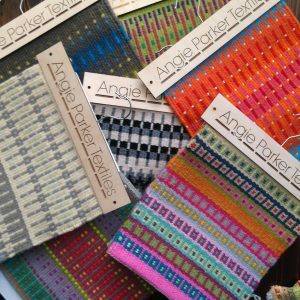 101 ways to commission an Angie Parker handwoven rug or textile artwork. Ok, that’s slightly mis-leading. 101 examples would be a little arduous to read (and write). What I’m really trying to say here is that every commission, by its very nature, is going to be different. And lets face it, that’s part of the reason you’re looking at commissioning and not buying ‘off the peg’ isn’t it? Luckily, it’s just an arrangement between myself and my clients, so we can keep it pretty simple. Let me run though a few pointers to show you just how simple it can be. The first step comes from you. 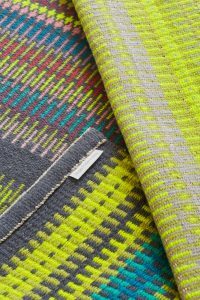 Whether you discover my passion for eye-popping handwoven colour in a contemporary Craft gallery or through the power of the internet, a short enquiry email from you starts the ball rolling. I’ll get back to you to arrange a phone conversation (or more email if you prefer) to establish your thoughts on design, size, colour and budget. 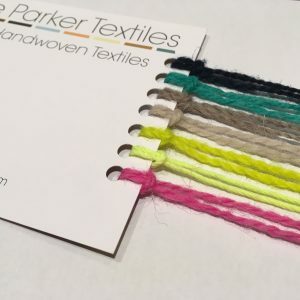 I’m easy to chat to and enjoy having these conversations and at this stage, I’m very happy to send you yarn samples, a quote, a time frame and a simple sketch, with absolutely no obligation. 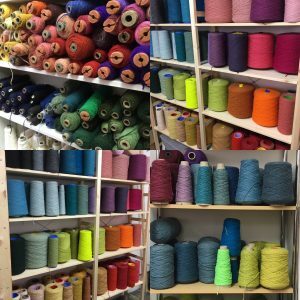 I’ve a huge selection of wool and yarns for furnishings in stock, but if I haven’t got the exact shade you require then I can ask my supplier to custom dye the wool to match. “Can you weave ‘that one’ but use orange instead of yellow?” Yes I can. “Can you do one ‘like that’ but longer” Yes, I weave up to 1m width but length can be what ever you wish. “Can I weave part of it?” Yeah sure. We can arrange this. Sometimes, I’m able to visit clients in their homes with example rugs & samples to help work through the design options, though I can’t promise that this will always be possible. Photographs are the next best thing so I’ll probably ask you to send over a few shots of your home if you’d like guidance about colours and designs. When you’re ready to proceed, I’ll then draw you up a more detailed sketch and give you a clear time frame in return for 50% of the total price. I can even weave a sample (30x30cm) for a small additional fee. 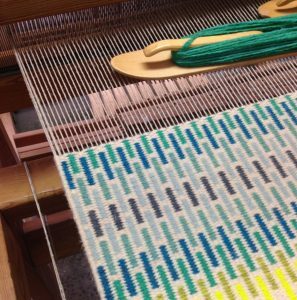 I can email photo’s to you if you’d like to see your rugs progress, or you might just choose to have a surprise when it’s complete. 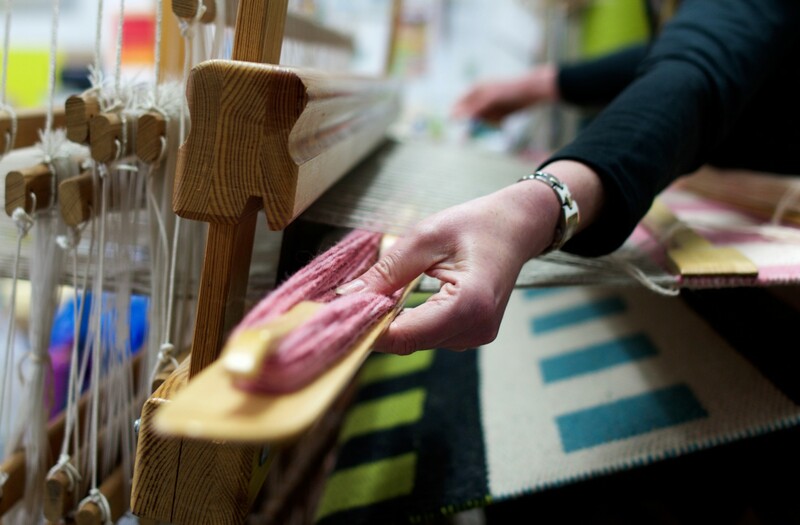 Once off the loom I then finish the piece by hand and stitch on a discreet label before carefully packing. Delivery is then arranged, usually with my favourite specialist art handlers, Flight Logistics, upon final payment. If, for any reason you’re not entirely over the moon with your rug let me know right away. I always build up a good relationships with my clients, so they know they can contact me with any concerns, safe in the knowledge that I will do my upmost to rectify. (Disclaimer-I’ve not actually had an unhappy client yet, so I’m thinking on my feet with this one). 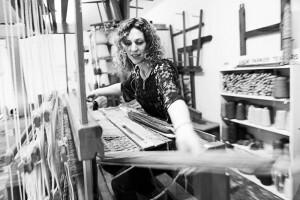 Finally, each commission is a special to me as I’ve been assured my rugs are to my customers. This really is a mutually beneficial way of doing things. 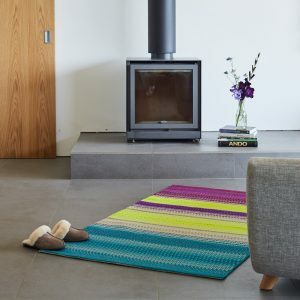 You get a bespoke, quality handcrafted piece of floor art which brings a burst of uplifting colour (or monochrome design) to your home. An expertly woven heirloom that lifts your spirits and brightens your day in the way that only handmade items do. And me? Well, your investment means that I can continue to grow my business, fulfilling the dream I had at college over 20 years ago, and much more. And you thought you were ‘just’ commissioning a rug! If you like what you’ve read but aren’t ready to commission a piece, why not follow me on Instagram or Twitter so that you’d don’t have to worry about remembering my name in five years when you’re leaving work and your collegues want to get something special for you? Better still, sign up for my quarterly news here. *I’m working on a more comprehensive FAQ’s page which will be coming to my website soon. 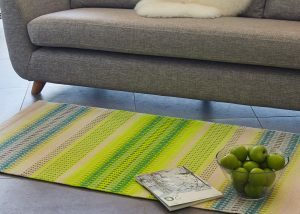 What do recycled plastic bottles have to do with handwoven rugs?